Defenders of the Soviet Arctic during the Great Patriotic War, commonly called Alyosha. 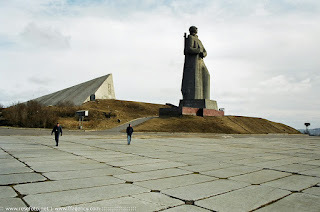 Alyosha is a monument in Murmansk, Russia to Soviet soldiers, sailors, and airmen of World War II (called, in Russia, the Great Patriotic War). The statue is 35.5 metres tall. It is the second-tallest statue in Russia, after The Motherland Calls in Volgograd. The weight of the statue, which is hollow, is over 5,000 tons. The soldier faces west, toward the Valley of Glory, where the fiercest fighting of the Arctic Campaign occurred when the German invaders were turned back from the approaches to Murmansk at the Zapadnaya Litsa River in July 1941.